With apologies to Clement C. Moore I want to share an experience of this dietitian during a brief respite from nutrition during this past week. I had just settled my brain for a short winter’s nap, while quietly sitting and drying my bright candy-apple red sparkling toenails under the polish dryer. I was thinking to myself about how no one would see my bright sparkly toes under the warm snow-protecting shoes that I wear in winter. When what to my dietitian’s ears should arise, but the chatter of a neighboring client (who more sensibly had the sparkles on the tips of her fingers). She exclaimed with such delight, that she was ordering pizza for her family that night – a Mediterranean pleasure she frequently served with nutritional peace of mind. She was chubby and plump, a right jolly middle-aged elf, trying to get all her holiday errands done. Why did her comment wake me out of my toe drying stupor and cause my mouth to be drawn up like a bow? Why didn’t I spring from my chair and run to the window in a flash or tear open some sashes, or tell her what’s the matter……as my eyes were rolling to the back of my head? In a twinkling I heard in my mind, “Maybe she’ll read Dr. Grandma’s blog or our 2009 Newsletter on the Mediterranean diet and get it straightened out.” My eyes, how they twinkled, when we said our pleasant goodbyes, but I must confess my conflicted emotions were clashing, as she dashed away, unenlightened. It’s the holiday season, after all. People have so many extra activities to accomplish, that they rely on fast food to feed themselves and their families. I must admit that I am not so old that I can’t remember what’s involved when the children are still home. I have compassion for the harried parents running around collecting every last stocking stuffer. But what really woke me out of the stupefied state of toenail drying was the mention of the Mediterranean diet and what a healthy choice pizza was. Of course you can make a whole wheat healthy pizza see our recipe, but it’s quite a bit trickier to get in and out of the pizzeria and stick with the Mediterranean-style of eating. This is not the first time this scenario has happened to me; it seems that many people are getting the word about the Mediterranean-style of eating being a healthy choice (and for that I’m grateful), but so many are translating it to American-style Greek and Italian food. So if they go to a restaurant and choose, a big pile of cheese –filled white flour ravioli; lasagna; pizza with a pound of cheese on top, or a serving tray of white flour spaghetti, topped with giant meatballs – then they announce that it’s Mediterranean health food. So with that long introduction, you can understand why I felt a review of the Mediterranean-style of eating was due. To begin, I believe that the word is filtering to the general public for good reason. There is a mountain of excellent evidence since the early 1960’s and it has grown in recent years that the olive-growing regions of the Mediterranean (especially, Crete, Greece and southern Italy) have a lower rate of cardiovascular disease (CVD) and a longer life expectancy. By paying close attention to what we eat, we can reduce our chance of cardiovascular disease, including stroke; diabetes; Alzheimer’s disease; hypertension; inflammation and metabolic syndrome, and obesity. All of these health problems/disease states have been shown to be related to diet; so every step you take toward the real Mediterranean-style of eating is a step well taken, toward reducing your risk for these serious health problems. One of the facets of the Mediterranean-style of eating that I’m so fond of is that it focuses on what you CAN EAT. For so many decades we’ve been concentrating on what not to eat; maybe it’s six of one and half a dozen of another, but to me it’s less emotional than keeping the spotlight on ‘forbidden’ foods. I’m not a psychology major, but it seems to me that spending considerable time on depriving myself of ‘forbidden foods, makes them seem powerfully attractive, alluring, and enticing. When I’m looking for foods that I enjoy and adding them to my health goals, my focus is on looking for those foods, not on what I can’t have. The strategy is to focus on what I CAN eat and what I DO enjoy. I hope that you have discovered how truly delicious fruit, vegetables and whole grains can be. During this past year we’ve provided quite a large collection of new recipes and innovative ways to use vegetables and fruit on our website. In addition, we’ve tried to help by continuing to provide products using 100% whole organic hard red spring wheat. Certainly, there are thousands of other recipes and many other whole grain products that are now available. If you haven’t’ tried whole grains and increasing plant-based foods in your diet, we encourage you to take a few steps in that direction. When you’re eating predominately plant-based foods and are decreasing the intake of animal-based and processed foods, it follows that you decrease the intake of saturated and trans fats. Yeah!!! But you need a cooking oil to make those delicious Mediterranean-style dishes. Nothing is more central to the Mediterranean style of eating than choosing extra virgin olive oil. By doing so, you increase yumminess and you decrease the intake of omega-6 fatty acids in comparison to the omega-3’s. These are also found in abundance in certain fish oils, and hold great promise for significant health benefits. It is not just one well-known nutrient in extra virgin olive oil that makes it great. It also has a higher content of phenols than the more refined olive oils and other types of vegetable oils. It has been shown that HDL cholesterol (the good/protective type of cholesterol) increases with the phenolic content of extra virgin olive oil. In addition oxidative stress (and the inflammation associated with metabolic syndrome) is decreased with increasing phenolic content. No need to remember anything about phenols and their antioxidant properties – just remember to choose extra virgin olive oil when you purchase cooking oil. The scientists can list a lot of the nutrients that matter in extra virgin olive oil, but they can’t put their finger on all the reasons why taken as a whole food, it is so often correlated with better health. The Mediterranean-style of eating has a moderately high intake of fish; a low-to-moderate intake of dairy products (often yogurt); and a low intake of meat and poultry. A moderate intake of alcohol, primarily in the form of wine (5 oz. wine is a serving) and consumed with meals is one of the facets of the Mediterranean-style of eating. Many health professionals, including myself, discourage people from taking up drinking for health benefits. One drink a day for women and two for men is considered moderate, anything more than moderate drinking can be harmful to your health. Beware, selling alcohol is very profitable, so marketers are hyping the health benefits of drinking wine for all its worth. It is not a magic food. There are so many well-designed studies confirming that the Mediterranean-style of eating has been associated with high life expectancy and low rates of cardiovascular disease and other diseases. Unlike drugs and crash diets, the Mediterranean-style of eating has no downside or side effects. The effort involved in changing your eating style to Mediterranean, is worth the effort many times over. The food tastes good, there are an almost unlimited variety of recipes and cuisines, and exotic or expensive ingredients are not necessary. I especially like the fact that switching to the Mediterranean style is NOT going on a diet. Instead, you are changing your eating style permanently. A permanent change spells ‘no regain’ after the weight loss phase is over. This morning I saw the glow of the moon on the new-fallen snow; the scene was beautiful; but the romanticized White Christmas left this California native after shoveling for 2 ½ hours – a big storm, therefore, I may be making another quick Mediterranean-style dinner tonight (see last night’s dinner below). So far I’ve seen no dashing, dancing, or prancing; but if the snow slows a bit, I’ll dash out to get the groceries for our Christmas Eve guests (there will be plenty of fruits and vegetables). How can you move toward Mediterranean-style of eating when you’re in a big hurry? Did you know that the December holidays are big sales days for jars of pasta sauce? My guess is that it’s because so many people are in a hurry. I know that I am. So let’s return to the concept of eating traditional American Italian or American Greek food; let’s return to the plight of the sparkly-fingered pizza lady. I think you can find an intersect of fast, flavorful and Mediterranean-style of cooking and eating. The following is what I did in a big hurry on Monday the 20th. 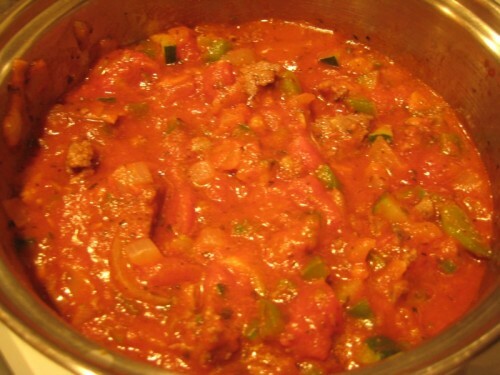 Making this style of spaghetti sauce triples the volume of vegetables. 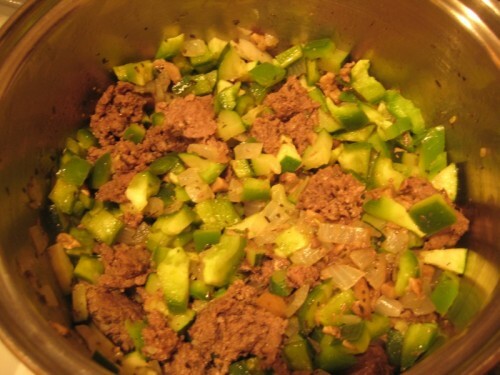 You can make it without the meat just as you and your family prefer. Because the sauce has 380 milligrams of sodium per serving, you may decide as I did, to add no salt to the pasta water nor more to the sauce than it already has. It’s not a fancy dinner, but the flavors were quite delicious. 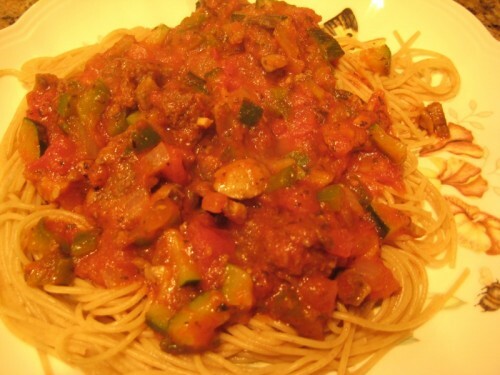 The calories of the Hectic Spaghetti dinner are a small fraction of most pizzeria pizzas. If you haven’t tried whole-wheat pasta in the past year or so, do so; it’s so much better than it was several years ago. The texture and flavor have come a long way. Brown the onions in the oil. 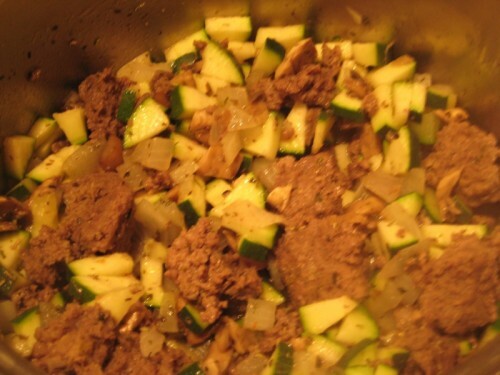 Add the herbs, beef, mushrooms, zucchini and peppers; simmer until all ingredients are done; stirring every few minutes. Add the jar of sauce and heat thoroughly. Serve over the spaghetti. Some meat and lots of vegetables. 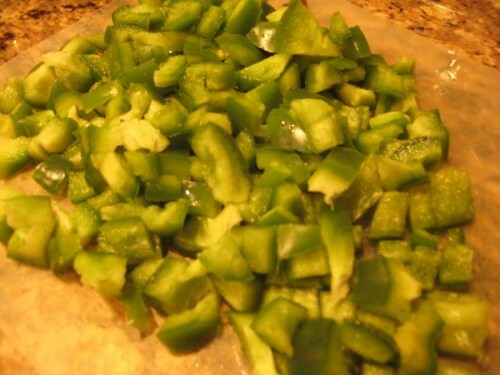 Chopped bell peppers ready for the sauce pan. Blending flavors and cooking inredients. Heat the sauce until hot and bubbly. Serve your speedy recipe over whole grain pasta.